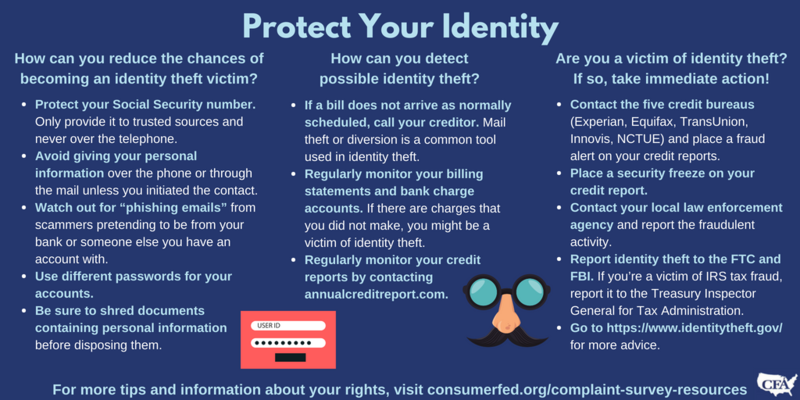 According to its last Consumer Sentinel report, the Federal Trade Commission received 371,061 identity theft complaints in 2017, down from 399,222 the previous year. That’s good news, but the 2018 Identity Fraud Study issued by Javelin Strategy & Research tells a darker tale. Based on a random survey of Americans, it revealed that there was an 8 percent increase in identity fraud (the fraudulent use of someone’s personal information) from 2016 to 2017, and losses rose from $16.2 to $16.8 billion. Javelin also notes that while the chip cards have cut down on fraud at terminals or by cloning devices, this drop has been more than offset by the rise in online theft and fraud. How can you reduce the chances of becoming an identity theft victim? Protect your Social Security number. Only provide it to trusted sources and never over the telephone. Watch out for “phishing emails” from scammers pretending to be from your bank or someone else you have an account with and asking to confirm your personal information. Use different passwords for your accounts. Knowing that people often use the same passwords for all of their accounts, an identity thief who obtains your password for one account is likely to test it to see if it works with other places where you might have accounts. Place a security freeze on your credit report. This prevents credit reporting companies from releasing your credit report without your consent. With a security freeze on your credit report it would be unlikely for a thief to succeed in opening new accounts using your personal information. As of September 21, 2018, you have the right to ask each of the credit reporting companies to freeze your credit file, to lift the freeze when needed, and to re-freeze your file whenever you want, at no charge. How can you detect possible identity theft? If a bill does not arrive as normally scheduled, call your creditor. Mail theft or diversion is a common tool used in identity theft. Regularly monitor your credit reports by contacting annualcreditreport.com. You should know that there are several credit reporting agencies. Among the most prominent are: Transunion, Equifax, Experian, Innovis and National Consumer Telecommunications and Utilities Exchange (NCTUE). While Innovis is a distant fourth to the first three, it is fast rising as a credit reporting agency of general use. NCTUE is primarily used by telecommunication outlets when consumers (or fraudsters) apply to open accounts for cell phones and other data devices. Contact the five credit bureaus (Experian; Equifax; Trans Union , Innovis and NCTUE) and place a fraud alert on your credit reports. Contact your local law enforcement agency and report the fraudulent activity. Report identity theft to the FTC and FBI. If you’re a victim of IRS tax fraud, report it to the Treasury Inspector General for Tax Administration. Go to https://www.identitytheft.gov/ for more advice about the steps you should take in your particular situation. This blog is one of a series of articles contributed by state and local consumer agencies in connection with the annual survey about consumer complaints conducted by Consumer Federation of America. The survey report provides “real life” examples of complaints and tips for consumers. Have a consumer problem or question? Find your state or local consumer agency at https://www.usa.gov/state-consumer.